Update Sept. 26, 2015: I’ve been doing this for a year and a half and it really works. I leaned a few things. Updates below. Given the exorbitant price of triple, quadruple and 5-blade cartridges, any way to increase their life should save you money. I read long ago that Gillette spent $500 million to develop their 5 blade razor. I don’t know if that’s true or not, but recouping such a ridiculous research investment certainly explains the high cost of multiple-blade cartridges. Straight razors use a leather razor ‘strop’ to sharpen the blade. For replaceable cartridge razors, the short video below shows how to make a cartridge razor ‘strop’ out of denim jeans. Swipe away from the edge. In other words, don’t shave the jeans. Gary North made a strop from denim jeans. 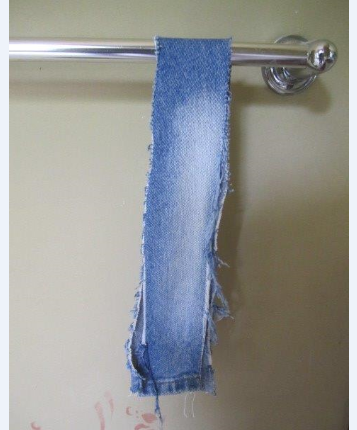 He sliced off a strip about two feet long from old blue jeans, hung the strip over a towel bar and stapled it at the bottom. See the picture below. I’m not sure what the red stains are on the wall below the strop, but it’s a reminder that you’re handling razor sharp blades so watch your fingers. Do at least ten swipes in each direction and remember to swipe away from the edge in each direction. Update: My double blade needs about 30 strokes in each direction. There are also other ways to extend the life of cartridge razors. By soaking in oil, alcohol or vinegar, you avoid rust, oxidation and corrosion caused by moisture, oxygen and your skin’s salt and acidity all of which hasten the dulling of razor blades. Click on Wise Bread for these money-saving tips, razor drying techniques and a discussion of various oils and emollients you can use. I’ve begun soaking my razor in olive oil for no other reason than I have lots since I no longer cook with it because high temperature produces carcinogenic acrylamides. I now cook and fry with coconut oil which is healthier and not nearly as perishable as olive oil. For more discussion on olive oil vs coconut oil see here and here and here. Update: I stopped soaking in messy oil long ago and it makes no difference. If you live in a high humidity or salt-spray sea shore area you might need to do this, but try without and see if you really need oil. Many cartridge razors have lubrication or moistening strips that are more gimmick than useful. Since I haven’t tried these long-term techniques yet, these gimmicky strips will probably wear out before the blades do. I expect we won’t miss them. Another tip: I learned long ago to shake the water off and then carefully towel dry the razor and cartridge after using it. This prevents unsightly soap scum from building up and keeps the razor looking new. I do this because I never pack my razor with check-in luggage when flying to prevent its loss in the event the airline loses my luggage (and a 19 year supply of blades down the drain). Instead, I remove the cartridge and pack my empty razor with carry-on luggage or with my laptop. With my laptop I slip it into one of the pen-holders along with other pens and, without the cartridge, I’ve never had a problem with airport security. If it looked grungy and scummy, it might attract attention. NOTES: I’ve been using a Gillette twin-blade ‘ATRA’ for decades and I stockpiled 15-cartridge packs when prices ranged from $2.49 to $3.47 per pack (today I saw them at $5.49 but they’re getting hard to find). The average price I paid works out to less than 20¢ per cartridge so I never saw much need to extend razor life. However, I’m going to give it a try. Less garbage is always good and additional savings are a nice benefit. And, who knows; I might even live more than another 19 years. Worse things could happen. Update: I was changing blades after three months (one broke the small plastic pin boss) but I wanted to see how long I could keep a blade going. It’s been nine months on the last blade and it’s still going strong. There’s no reason a blade can’t last a year. I plan to change them every year at Christmas unless they break. My 19 year supply will now last 494 years; a lot longer than I’ll last. If you have any ideas or tips to add, please leave a comment below. This entry was posted in Hints and Tips and tagged cheap razor blades, extend razor blade life, Gary North, longer life razors, longer razor blades, razor blades. Bookmark the permalink. Is the below information correct regarding Canadian bank accounts? My only other question is when this train wreck ends will any bank account go untouched or would everyone’s hard earnings be wiped out in a collapse and what happens to those individual’s that are holding debt, mortgages, lines of credit etc. ? Technically, when people deposit money into a bank they are turning over their property to that institution in return for a debt claim. The money is no longer theirs: it belongs to the bank. They become an unsecured creditor holding an IOU. This means that banks can legally refuse to return someone’s money on the spot, at least until the conditions of their agreement (that fine print when you open an account) have been completed. Good questions, Ken. Let’s move the discussion to a more appropriate thread like https://geroldblog.com/2014/04/10/bdi-crash-alert/ rather than one on razor blades.